Ithaca, NY USA - Matereality’s Version 10 release provides new software components for its enterprise installations, including bulk data loading capabilities and enhanced material parameter conversion support for LS-DYNA® and Altair® RADIOSSTM material models. 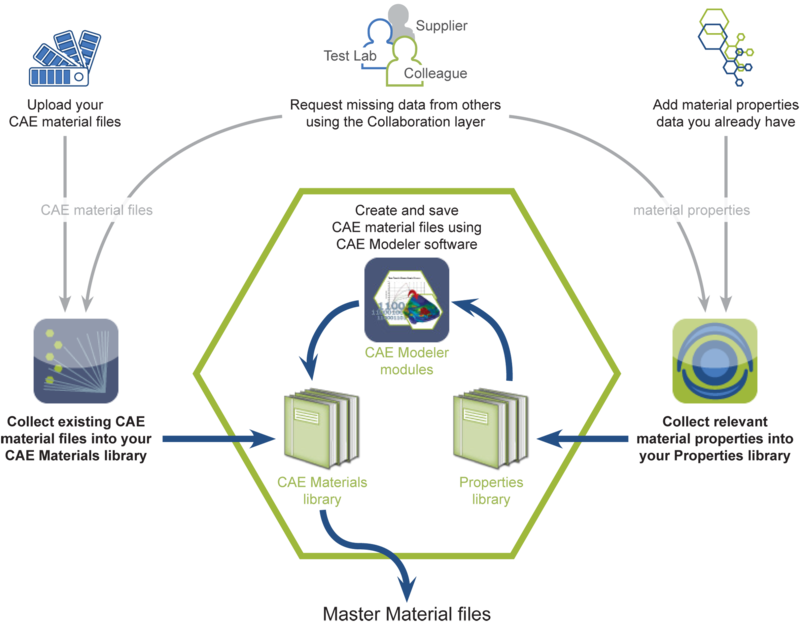 The release delivers tools to manage the CAD/PLM/CAE materials workflow and customize role-specific user experiences, and expands the authorship layer for creating and disseminating technical documentation. Company data is often contained in many isolated tables and databases which must be consolidated into the enterprise-wide system. This tedious process, a hurdle for enterprise-wide adoption, is greatly eased with the Simple Loader, a new app which enables bulk loading of tables of single-point property data from Excel, greatly speeding up the capture of large quantities of data. It is now possible to rapidly populate a materials database with relevant information of the enterprise. In addition to importing property data, bulk loaders are available to import lists of materials and specifications to Matereality’s data libraries, making them more complete and meaningful. Incorporating a new software framework, Matereality v10 handles increased demand for material model parameter conversion. Support for LS-DYNA MAT_089 and MAT_019 is now available with graphical drag-and-drop capability to tune and extrapolate plasticity curves as well as rate-dependency parts of these models. Support for Altair’s RADIOSSTM explicit solver has also been initiated with a CAE Modeler module for its commonly used Law 36. "We continue to devote resources to this important task of incorporating materials into simulation, bringing years of DatapointLabs experience to simplify this complex and sometimes confusing process," says Hubert Lobo, DatapointLabs founder and Matereality CTO. "For those of our clients who perform their own parameter conversion, a standard export from our software allows them to locate the right data and supply it to their own macros for streamlined data processing." "We continue to devote resources to this important task of incorporating materials into simulation, bringing years of DatapointLabs experience to simplify this complex and sometimes confusing process." Many enterprises have initiatives to bring simulation into the product development mainstream. An important process step is to ensure that the correct material models are used in the simulations. Matereality’s CAE Materials library documents and stores material model files linked to the correct material or specification names used in PLM software. These stored material model files can be organized into Master Material files for export into Altair HyperWorks® and Beta CAE's ANSATM pre-processors. There, the files can be assigned to parts based on material IDs assigned from the bill of materials (BOM), ensuring consistent use of material models, even across globally distributed design teams. Because of the diversity of users who need to interact with material information, it is important to create user experiences that correspond to their roles within the enterprise. The new roles manager framework allows system administrators to individualize dashboards, to present data and software tools of specific value to materials engineers, CAE experts, designers, and other professionals in their enterprise. For added traceability, the new release provides text editing capabilities for documentation of the test methods used for property measurement. Test methods are displayed alongside properties and data certificates, so that engineers have all the information related to a piece of data available at their fingertips. Additionally, enterprise installations can author their own technical documentation, including instructions, how-to videos, and technical papers related to materials. A Knowmats app has been added to provide open access to a knowledge repository that has been set up to collect and disseminate knowledge related to the topic of "materials in simulation." Matereality® Software for Materials gives manufacturing enterprises the means to build a centralized, secure materials knowledge core to store properties, CAE material files, specifications, and material information on any material. The built-in suite of web-based software helps engineers visualize and understand material data, create CAE models and manage materials information. The company also operates private and public material databases on the cloud. Matereality's ready-for-deployment, patented technology provides material databases and solutions for different needs, budgets and company sizes: a Personal Database for the single user, a Workgroup Database for small groups, and Material Data Servers for the enterprise. Matereality is the software arm of DatapointLabs Technical Center for Materials, which provides accurate material testing, material parameter conversion and validation services for CAE, allowing companies to populate their databases with high-quality, application-ready data for design and new product development. Together, the companies form a comprehensive resource to strengthen the materials core of manufacturing enterprises. For more information, visit www.matereality.com, telephone +1-607-257-1784, or send email to info@matereality.com.